The Sylvester & Tweety Mysteries is an American animated television series produced by Warner Bros. Animation which aired from 1995 to 2000 on Kids' WB. The final episodes, "The Tail End" and "This is the End" never aired on Kids' WB, and remained unaired until December 13, 2002, when it aired on Cartoon Network. 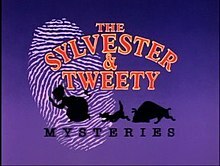 The show follows Looney Tunes characters Sylvester and Tweety Bird, and their owner Granny, along with bulldog Hector (who appeared in several cartoons alongside Tweety, Sylvester and Granny but was in the series given a new design similar to that of Marc Antony), as they solved mysteries, even with Sylvester still trying to eat Tweety in the middle of solving the mysteries, but Hector acted as a bodyguard for Tweety, and would even beat Sylvester up (usually out of shot, but sometimes behind a blind). The first season was dedicated to the memory of Friz Freleng, Warner Bros. animator and the original creator of the Sylvester and Tweety pairing. Freleng had died of natural causes at age 88 only months before the series premiere. Also, it contains one case per episode, in contrast to the other seasons, which all had two cases. Other Looney Tunes characters make cameo appearances, including Daffy Duck, Yosemite Sam, Elmer Fudd, Tasmanian Devil, Pepé Le Pew, Beaky Buzzard, Babbit and Catstello, Hubie and Bertie, Foghorn Leghorn, Witch Hazel, Michigan J. Frog, Rocky and Mugsy, Marvin the Martian, Hippety Hopper, Gossamer, Count Blood Count, Sam Sheepdog, Cecil Turtle, Nasty Canasta, The Crusher, Pete Puma, Merlin the Magic Mouse, Goofy Gophers, Hugo the Abominable Snowman, and latter-day Warner cartoon star Cool Cat who appears in some form in most of the episodes. Bugs Bunny, Porky Pig and Wile E. Coyote & Road Runner don't appear in this series. However, Colonel Rimfire, Cool Cat's nemesis, did appear in the show. The final episode of the series never aired on Kids' WB (in which, after decades of trying, Sylvester succeeded in eating Tweety, but it turns out to be a dream), but did air on Cartoon Network in 2002. Sylvester (voiced by Joe Alaskey) – Sylvester acts as narrator throughout the episodes, and continually tries to devour Tweety for his supper, though he is always thwarted by Hector or Tweety's craftiness. Despite their never-ending feud, the pair manage to get along for the most part, and Sylvester will defend Tweety when someone else tries to harm the canary. Sylvester also unwittingly discovers many clues, claiming as the narrator to have knowledge of the case (though this is probably bluster). Besides chasing Tweety, Sylvester often explores the surroundings, leading him to sometimes be in awkward situations (i.e. being chased by a male cousin of Pepe Le Pew, Pitu Le Pew or using Granny's umbrella to pierce a villain's blimp). Through these situations, the baritone and tenor singing, lisping Tuxedo cat endures all manner of pain and suffering, but comes out none the worse for wear. Sylvester is allergic to wool and is jealous of Tweety. Tweety (voiced by Joe Alaskey) – A cute but sadistic Yellow canary. Tweety is often trying to escape Sylvester by foiling him through either his flying, clever timing, or his virtual bodyguard, Hector. Tweety usually stays with Granny and is responsible for some major clues. Despite his feud with Sylvester, the pair will team up if Granny is threatened and can work together very well. Tweety also serves as a source of ironic humor at times, usually in reference to Sylvester's foiled attempts to eat him. The show also harks back to Tweety's earlier shorts by Bob Clampett (in fact, Tweety meets his old self in the episode Seeing Double, depicted as a separate character called Orson, Tweety's prototype) and he is not above malice towards "dat bad old putty tat". Granny (voiced by June Foray) – A practical old fashioned world-renowned detective, Granny travels the globe with Sylvester and Tweety, attending events such as races or canary contest and is often called upon by the locals to solve a crime. However, there have been attempts to frame Granny, causing some difficulty in finding clues. She is overprotective of Tweety, and will not hesitate to give Sylvester a good whack on the head. She sometimes calls upon the cat to investigate clues or defend the group while they sleep, though, showing signs of obvious trust. Granny is good natured mostly, but can become stern. With Granny as the main detective of the show, she bears similarity to Miss Marple. Hector (voiced by Frank Welker) – Granny's bulldog and Tweety's bodyguard. Hector keeps Sylvester from eating the canary and will often beat him up if he gets in his way. Hector will defend Granny, Tweety or even Sylvester if threatened, but is not above stealing food or trying to please others. The series has aired on Boomerang from August 17, 2015 to July 3, 2017. The series also returned to Cartoon Network on October 26, 2015. On September 9, 2008, Warner Home Video released The Complete First Season of The Sylvester and Tweety Mysteries on DVD in Region 1. This release comes exactly 13 years since the premiere of the show. No further DVD releases have been announced. The series was nominated multiple times for a Daytime Emmy Award in the category Special Class Animated Program. The series won two Annie Award in the category of voice acting for June Foray in the role of Granny. ^ "BMI - Repertoire Search". archive.is. 10 April 2013. Archived from the original on 10 April 2013. ^ Mendoza, N.F. (October 22, 1995). "WB Raises the Animation Ante". The Los Angeles Times. Retrieved 23 March 2011. ^ "Sylvester & Tweety Mysteries: The Tail End / This Is the End - TV Tome". web.archive.org. 27 April 2004. ^ TV.com. "Sylvester & Tweety Mysteries: The Tail End / This Is the End". TV.com. The Sylvester & Tweety Mysteries at Don Markstein's Toonopedia. Archived from the original on January 1, 2018. This page was last edited on 23 April 2019, at 22:31 (UTC).